Operatives of the Lagos State Police Command have arrested two teenagers for allegedly breaking into a shop on Jakande Estate, in the Ejigbo area of Lagos, and stealing a laptop. 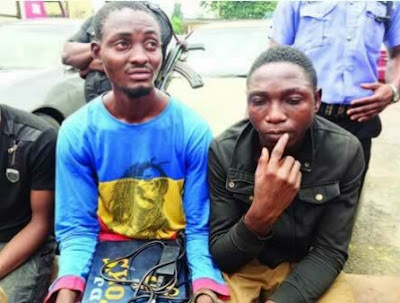 The police also arrested two others – 27-year-old Adejagun Babatunde and 20-year-old Lawal Wasiu – for allegedly receiving the stolen laptop from the teenage burglars. The Lagos State Commissioner of Police, Edgal Imohimi, on Wednesday said the case was worrisome because minors were involved. Imohimi said, “The command’s operatives attached to the Ejigbo Police Division on September 2, 2018, arrested two teenagers (names withheld), aged 13 and 14, who specialised in breaking into people’s shops. “Luck ran out on them when they burgled a shop at Block 397, Jakande Estate, Ejigbo, and made away with one generator valued at N15,000; one HP laptop, valued at N90,000; one amplifier, valued at N40,000; and one CD mixer, valued at N150,000. One of the teenage burglars, said he took the laptop inside an opened shop, adding that he was accompanied by his friend to a complex at Ejigbo where they were paid N2,000 for the laptop. The second teenage suspect said he was only involved in selling the laptop. The buyer of the laptop, Babatunde, said he got to know the boys through Wasiu. Tiwa Savage’s bare bottom shorts causes a frenzy online!